False facts are highly injurious to the progress of science, for they often long endure; but false views, if supported by some evidence do little harm, as everyone takes a salutary pleasure in proving their falseness. You have to get the facts right. The Chicago purchasing managers index has risen to the highest level in 22 years at 68.6. The median has been 55.1. A close look at the components will show every part rising with especially big moves in order backlogs and employment. This is good news as we start the year. You have to go back to the 1980's to get this level. While GDP growth has only been 2.5% , we may be in for a upside surprise in GDP. S&P saw more ratinsg upgrades than downgrades for the first time since 1997. In 2009 ratings downgrades occurred three times as often as upgrades. Moody's has a similar profile of upgrades to downgrades. The reason is cash. Companies are holding $1.7 trlllion in cash, the most in 70 years. Profits are also higher which translates to upgrades. Most upgrades are with lower rated companies as default rates fell significantly. Good news of debt-holders, but what will these firms do with the cash? China stated that it will provide "concerted action" to help the EU with stabilization. It is using its financial muscle to buy bonds and serving as a form of lender of last resort. It will provide stabilization "if necessary". It has already stated that it would support Portugal during a recent state visit by President Hu Jinto. Prime Minister Wen Jaibao stated earlier that China would support the Greek bond market. This financial policy makes perfect sense since the EU is the largest trading partner of China and it will get more for its money in terms of yield relative to holding US Treasuries. China also wants a lifting of the arms embargo and change in status to "market economy" from the EU. This form of financial statecraft has been used by other countries for decades so it should not be surprising that China will use its cash horde to buy EU bonds at the right time especially if there is the belief that in the short-run these bonds will be money good. China raises rates again - what does it mean? China raised interest rates again over the week-end by 25 bps in order to slow monetary growth and stop the inflation increases which have picked-up this year. While this is a continuation of the policy of trying to slow credit growth, it may not have much of an effect given rising prices. The real rate of interest is not rising. Additionally, since most lending is done through banks that are not truly independent, the expansion of credit is not really driven by the price-side of the equation as much as the quantity-side. If banks want to reduce credit, then they have to stop lending and not just have prices adjusted. It is the lending quota set at the end of the year that will matter most to whether credit will slowdown. The rise in inflation will be a key issue for China. It can be curtailed through allowing the exchange rate to rise.The amount of dollars that have to be purchased will be reduced which will allow for a slowdown of credit. Dan Ariely has been at the forefront of studying behavioral economics. This study has had a significant change in the way we look at economic decisions and how information is processed. Nevertheless, how all of these decisions are incorporated in models is still unclear. We have a lot of studies which suggest that pure rationality does not apply to our thinking, but there is not a clear alternative theory. In his new book, The Upside of Irrationality: The Unexpected Benefits of defying Logic at Work and at Home, Ariely explores some of the positives of our irrationality. This research can have an influence with how we make investment decisions because it again addresses the lack of pure rationality that exists in our everyday thinking. Ariely provides some interesting insights in irrational patterns of behavior in both the workplace and at home. For example, big bonuses do not often make us work better. The threat of loss or failure actually can cause poorer work performance. Our work is also affected by whether it has meaning. The type of work and whether it seems useful ill have an impact on our productivity. Similarly, we overvalue anything where we are closely involved with the production. It is called the IKEA effect which is associated with valuing furniture which we create. We have a strong attachment to what we create which explains the not-invented-here bias in the workplace and home. If we have invested in an idea which we consider our own, we will overvalue it. At the home, we will get used to the same thing, so an object will have less value to us over time. We need to have something new to get a rush of happiness. This research is telling because it again shows how biases exist in almost ay environment. We can get away from our lack of rationality. Is this an upside? I don't think so, but the lack of rationality provides for a more interesting environment for dealing with others. As China Goes, So Goes the World: How Chinese Consumers are Transforming Everything by Karl Gerth dives into the details of Chinese consumers and their rise to power. Who should care about this group? The rest of the world should because the problem of global imbalances of savings will be adjusted through having those countries which have current account surpluses spend more and those which have deficits save more. At savings rates which are close to 50% of income, China is one country which can become more consumer friendly and lead to a change in global balances. However, a simple review of the changes in China suggest that the Chinese consumer has gone through a radical change in the last two decades. They have become significant consumers and have transformed the spending balance of the world. There may be talk about the future of the Chinese consumer, but the recent past is very impressive. 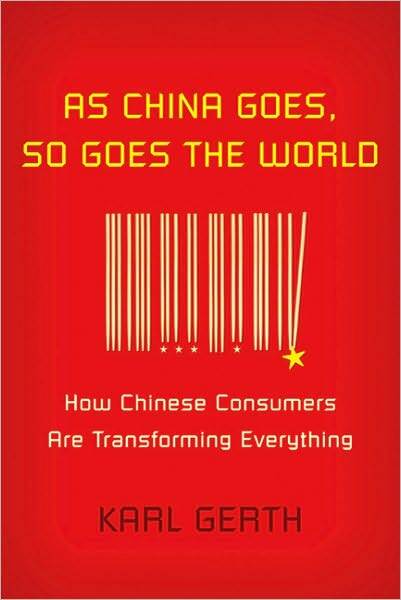 Karl Gerth provides a easy to read overview of the Chinese consumer culture and why there is no going back to the past. In a decade, the Chinese have become a significant car culture. The volume of sales outstrips the US. With the car culture comes a whole new set of freedoms and spending patterns. You can to a drive-thru for fast food. You can go to the drive-in. You can live in the suburbs. You can have a vacation. The consumer culture is pervasive. It has changed social attitudes, mobility, and class consciousness. There is a growing feeling of abundance and excess in China that did not exist t25 years ago. The new consumerism is transcending politics and will drive the global economy as tastes adjust to the demands from the China market. The influence of Taiwan has been especially strong. In fact, the influence of Taiwan and to a lesser extent Korea is greater than the impact of Chinese culture on these smaller countries. The future spending pattern and the growth of a middle class with disposable income will have a more significant impact than a pick-up of US consumer spending in the next two years. Bruce Greenwald and Judd Kahn offer some unique insights on the ongoing debate of globalization. From their point of view, many Americans have an irrational fear concerning globalization. This fear focuses on the idea that someone in another part of the world is taking good jobs from Americans. The political debate is usually focused on the negative side of trade. Their view in the book, Globalization: the Irrational Fear that Someone in China Will Take Your Job is that this fear is misplaced. Greenald and Kahn develop a strong case for their view of an irrational fear of globalization. Foremost, globalization is not new. The growth in globalization was actually faster in the '50-'75 period. The impact of globalization has also slowed because we are less dependent as an economy on agriculture and mining which was an important part of US trade. The US economy has seen a significant switch between manufacturing and services which has been much greater than the growth of trade and globalization. An even stronger argument is that countries control their fate more so than trade. Globalization is strong but not universal across all countries. The differences in country growth may be more due to issues unrelated to trade. The rising tide of globalization has not effected all boats the same. Prosperity is much more effected by localized economic changes. For example, the impact of regulation may have as importance effect on growth as trade. Productivity is varied across industries and countries and will have a greater impact on growth and job change than globalization. Employment trends dwarf the impact of globalization. The loss of manufacturing job is a direct result of productivity changes and the adjustments in the economy to be more service oriented. The impact of productivity has taken more jobs than any other single factor. The impact of globalization and profits is also not clear. Those businesses which are highly competitive and have lower returns on equity still have the same profile. The profitability of businesses are more effected by such factors as economies of scale, cost structure and overall demand. Many firms that are profitable in local markets are not successful when they move offshore. In international finance, the home field advantage is strong. Foreign direct investment is actually down from previous periods. There is no great theme of foreign firms buying up the US nor are US firms buying up the rest of the world. The key financing mechanism for most firms is still retained earnings and not foreign borrowing. For external funds, bank lending is still the key source over pubic debt or equity. The bank lending route is a more localized avenue for raising funds. It is unlikely that this will change in the near-term so financing has not been as effected by globalization. The key risk for globalization is still the reserve currency problem. The importance of the dollar has not diminished and their is no alternative reserve currency like SDR's to solve the problem of global liquidity. The other problem of globalization is the need for a consumer of last resort to offset the current account imbalances. The savings shortfall in the US needs to be offset by greater spending in the surplus countries like China. Greenald and Kahn provide an alternative story of globalization. Perhaps one sided in the direction against critics of globalization, the authors give a healthy different perspective to the globalization debate. Chris Chabris and Daniel Simons have written and engaging book psychology called the The Invisible Gorilla: and Other Ways Our Intuition Deceives Us. This book can be added to the long list of behavioral psychology work that have moved finance away from the pure rational expectations approach. The main premise is that humans engage in a long list of illusions that affect our judgment. Chabris and Simons focus on six illusions which distort our ability to make good decisions. The illusion of attention - We often do see what is actually in front of us. Our focus may miss the details which are obvious upon being referenced. The illusion of memory- We do not remember what actually happened. Our memories are often false even when they are vivid. The illusion of confidence- We view ourselves as being better than we actually are. The Lake Wobegan effect. The illusion of knowledge - We think we understand things better than we actually do. We should act more like weather forecasters and express our views or knowledge as probabilities. The illusion of cause - We often associate correlation with causality. The illusion of potential - We will often think that we have more potential than we actually do. Every part of investing is has the potential to be biased based on the set of illusions that are expressed by Chabris and Simons. A key job of any analyst is trying to limit the negative effects of these psychological barriers. In an effort to avoid the tortilla riots of 2007, the Mexican government has been active in buying futures options to hedge their demand for corn. This could be a key reason for the renewed increase in price in December which has taken corn futures to above $6 a bushel. Reported in Commodities Now and the Christian Science Monitor. it is reported that most of ext year's crop demand has been bought through the ASERCA program which has grown to over $800 million from only $80 million in 2006. The ASERCA program provides subsidies for producers and the food industry to reduce volatility to the world price of commodities. Is this what the Fed wants? We have had a stock market rally and bond sell-off since the Fed's announcement of QE2. The US still needs low rates and we have it for the short-end but holder rates has not been attractive. Housing will be hurt because mortgage rates will go up, unemployment will rise, because financing will be more expensive, loans will default and bank will be hurt on their carry trades.The idea of financing short and locking in longer rates has been a disaster for many bond traders. It is not clear that this is the result wanted by Ben Bernanke wanted when he announced the Fed program. We have not heard whether he is pleased or not. We know the buying program will continue, but what the Fed really wants are stable markets and it does not have that result in fixed income. Some say the current bond sell-off is market irrationality but with debt levels at such high levels, there is nothing irrational about reducing debt exposure especially if there is more talk about bondholders having to pay a price for failures. If anything, the idea that there is no principal risk in the US or in the EU is irrational. Simply put, bond vigilantes have returned and the world may be a better place. There is a confidence contagion in bond markets. This is from the retail side of the business as well as institution. If there is the belief that budget problems cannot be solved and the monetary authority does not have the people’s confidence to control prices, there will be less confidence in holding bonds. However, cash is not king at current levels. The problem is that investors will seek other risks which may be greater or more direct. Firm risk is more likely to be subject to market forces unlike government debt which can take-on many different alternative solutions. The new emerging market theme has moved from BRIC to BIIC. Drop Russia and add Indonesia. The economy is large, dynamic, growing, and young. Russia is large, static, resource focused, and old. The business environment in Russia has been negative and its behavior is more akin to a a classic emerging market dependent on natural resources for its growth. Indonesia also has natural resources but has a change to be a dynamic regional power-house. Indonesia is about 40% of the size of Russia but the current growth rate is over double. It is the momentum in growth that provides the best upside for businesses. Its finances are in good shape and the cost of dong business is low. Russia is driven by its natural gas and oil production. It is viewed as a difficult place for doing business and the population is declining as well as aging. There will have to be a significant change in government before dynamic growth occurs. Watch what I do and not what I say issue. ECB bond purchases have increased but the statements do not match. It is the ECB through its lending which has been saving the EU from disaster. However, correcting malfunctioning markets does not provide monetary stimulus. One year after exit strategy discussion, the bond purchases increase with unlimited loans to many banks. There is not the same talk about quantitative easing but make no mistake that the helping hand of the ECB is one of the key financial stories of 2010. Global oil demand is increasing with the pick-up in growth and this will place upward pressure on oil prices. There has been a break-out to a 26 month high. The demand shock is based on better economics in both developed and emerging markets. 2010 demand increased 2.3 million b/d. We are now at pre-recession levels above 88.3 million b/d in the third quarter. US consumption is going up, wit the biggest monthly increase since 2004, as measured by the Department of Energy. OPEC has to determine whether it should change quotas given this increase in demand. However, it is not clear that OPEC would like a higher price above $90 given the behavior demand to oil. Saudi Arabia needs prices above $74 and China needs oil prices below $90 to keep refiners profitable. The recession of 2008 cold be viewed as a reaction to the oil price shock in the first half of the year. Certainly, the gains in prices taxes consumers who have inelastic demand. OPEC would no like a repeat of 2008 based on a short-term shock in price. The tax cut is stealth stimulus. Obama stimulus II. How long are we going to call these temporary tax cuts that will last a decade the Bush cuts? Should they now be called the Obama temporary tax cuts? The payroll tax not for employer but for employees for one year.The extension of the tax cuts reduces uncertainty but cannot be viewed as a new addition for business growth. A number of other tax credits from the first stimulus package will be extended. Unemployment benefits will be extended. But what about a growth policy? A credible growth policy will see clear tax rates which will be in place long enough to allow businesses to make longer-term investment decisions. Elimination of tax rules which increase the cost of filing and tracking. Tax accountants should not be highly paid professionals. Clear sense of regulations so rule uncertainty is diminished. Not short-term incentives for hiring but ways of allowing businesses to make profits and then hire workers. It is unlikely we will see this kind of tax and growth policies. What can the EU do to resolves the debt crises? Is this the smart asset allocation? Will we ever go back to the Great Moderation?